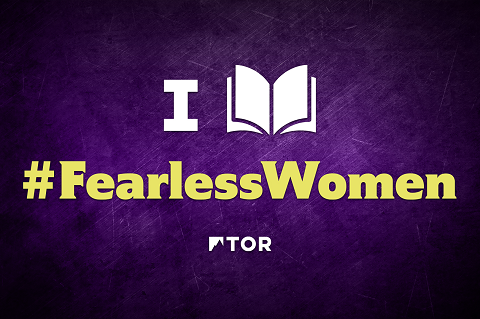 Today I’m excited to be a part of Tor Books’ #FearlessWomen celebration of science fiction and fantasy books by women and the blog tour for Jacqueline Carey’s latest epic fantasy novel, Starless—which will be released tomorrow! I absolutely loved this book, as you can see from my review below the book information. This is also followed by an excerpt from chapter three and a US/Canada giveaway of one hardcover copy of Starless plus a swag bag containing a Starless quote postcard, hawk feather, #FearlessWomen sticker, #FearlessWomen pen, and star confetti! 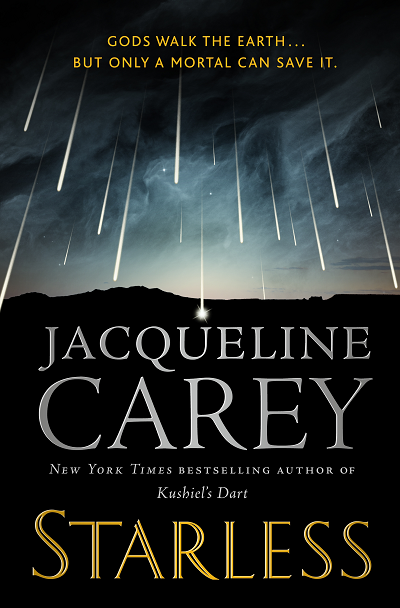 With STARLESS readers will fall in love again with Jacqueline Carey’s lush, character-driven fantasy: Kushiel’s Dart took the fantasy world by storm, winning the Locus Readers Award for Best First Novel and launching the New York Times bestselling Kushiel’s Legacy series. Now in STARLESS (A Tor Hardcover; $25.99; On-sale: June 12, 2018) Carey creates a whole new world and introduces a compelling hero. Pick up STARLESS and meet a hero whose journey will resonate long after the last page is turned. Jacqueline Carey is the author of the bestselling Kushiel trilogy and has won the Locus Award for Best First Novel and the Romantic Times Reviewers’ Choice Award for Best Fantasy Novel. Always an avid reader, Carey began writing fiction in high school. 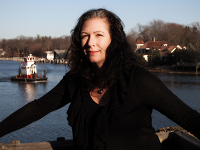 After graduating from Lake Forest College, she worked for six months at a bookstore in London, and returned to the United States with a driving passion to write professionally. She resides in western Michigan. Jacqueline Carey’s standalone epic fantasy Starless showcases her extraordinary skill as a writer and worldbuilder, but especially as a wonderful storyteller. It’s a beautiful, memorable novel incorporating the tropes of chosen ones and prophecies while exploring gender identity, honor, redemption, fate, love, and the necessity of change and progress. It’s riveting from the very first page, and though I did prefer the earlier smaller scale parts of the story to the later larger scale ones, I absolutely loved Starless. Long ago, the sky was alight with shining stars, the children of the sun and the three moons. But these stars grew weary with their place and rebelled against their parents. As punishment, the sun cast them to the earth and the gods have been bound there since. The land of Zarkhoum is protected by two of the sun’s favorite children, the Sacred Twins Parhkun the Scouring Wind and Anamuht the Purging Fire. Throughout the ages, a member of the royal family has occasionally been born during an eclipse, and their soul’s twin always comes into the world at the same time. In order to find this child, the priestesses of Anamuht find and gather the babies that could potentially be this shadow of the young prince or princess and drop a hawk’s feather from above—and the one who catches it is revealed to be Parhkun’s chosen. Khai is one such child, and before he and Princess Zariya were so blessed, there had not been such a pairing in 150 years—nor had a girl of the royal family ever been born during an eclipse before. As a shadow, Khai is raised as part of the Brotherhood of Parhkun in the desert, where he learns to fight so he will be able to protect the princess when they are both older. Though this training is traditional for the god’s chosen, Khai’s training is not conventional since it seems his god wants him to learn methods of stealth and trickery that the brotherhood always considered to be dishonorable. Far away, the angry god Miasmus is awakening and beginning to wreak havoc across the earth—and Khai and Zariya have a role to play in the upcoming fight, a destiny that draws them far from their homeland. With Starless, Jacqueline Carey weaves a mesmerizing story about a god-chosen young person who does his best to follow the path that’s been laid out for him since birth—and the strong, supportive bond he has with his soul’s twin that enables them to face their numerous challenges together. Though this is ultimately Khai’s tale as it’s told from his gracefully written first person perspective beginning with his training seven years before he meets the princess, Zariya plays a major role and is in his thoughts from the very start since he’s preparing to be a capable warrior in her service, like all shadows before him. Starless is composed of three distinct parts, each with a different focus. The first third of the novel concentrates on this early life in the Brotherhood of Parhkun, and even though I enjoyed the novel in its entirety, I found this part the most compelling and vivid from the desert setting to the individual characters who shaped the shadow in various ways. Khai’s relationships with his mentors are especially well drawn, particularly that with the unlikely Brother Yarit. He was a thief sentenced to death who opted to take Parhkun’s test and used devious means to pass it, meaning he was allowed to live as part of the Brotherhood. Their Seer believes that their god brought him to teach Khai, but Khai does not want to learn from someone without honor until he’s told of how the last shadow may not have failed his duty to protect his own soul’s twin had he had knowledge beyond honor. Despite their rocky start, Khai and Brother Yarit develop a close relationship and the latter was my favorite character. He can certainly be sneaky and keep a secret when the situation called for it, but his usual manner was coarse and straightforward—and as unlikely a member of the Brotherhood that he is, he even proves to be honorable in his own way, particularly when making sure Khai is equipped for his future. I would rate this first third alone a perfect 10, as I loved everything about it. The perilous heat and wind of the desert come to life, as do the two gods that reflect its nature. The land and its gods are intertwined, and the deities are larger than life, truly alien and godlike. Though insular, it also shows another part that is done so well throughout Starless: the variety of different cultures with different values and beliefs. As is shown more later, these are often tied to the land’s deity in some way, such as worshiping a two-faced god through convoluted speech or a shrewd god with bargaining and trade practices. This world expands more with each third that follows and continues to be fascinating; however, I didn’t feel that either section was quite as engaging as the desert and the true-to-life relationships Khai found there. In the middle part, Khai leaves the desert for the palace at sixteen years of age and meets Zariya for the first time—and goes from living among men to living among women. Normally, a young man would not be allowed to share a room with a princess in the women’s quarter, but Khai would have been raised as a girl had he not been chosen by his god and raised within the Brotherhood instead. Here, he grapples more with his complicated gender identity as someone who doesn’t quite fit into society’s expectations of men or women, and he also sees firsthand that some of his previous beliefs about women were misinformed. Zariya especially may be underestimated by people since a childhood illness left her unable to walk, but all who know her see that her heart is that of a fierce warrior. She’s a courageous, thoughtful person, and Khai immediately feels a deep bond with her due to their fated connection and comes to love her for herself as he gets to know her. With palace life comes some royal intrigue, and this section also shows more of the fire goddess Aramuht and the rising threat of Miasmus. The last third opens up the world even more since this is the part involving traveling with the prophecy-hunters in the book’s description. The various lands and peoples (and the sea-wyrms!) are fascinating, but I actually found this the least engaging of the three parts that make up Starless because the character relationships were not as strong. The voyagers were supposed to have a deep friendship forged by their experiences together, but I didn’t think it came through the page and dialogue as clearly as the bond between Khai and the Brothers or Zariya and some of her family. However, I still enjoyed it immensely even if I felt the last third was the weakest part of the novel. With Kushiel’s Dart, Jacqueline Carey immortalized the phrase “Love as thou wilt.” These words could also be applied to Starless, but I kept thinking that the journeys of its two main characters could be summarized as “Be as thou wilt.” Khai and Zariya unconditionally accept each other from the start and they both learn to accept themselves regardless of societal expectations. I loved this about them, and Starless is a beautifully written, readable book that I can definitely see myself rereading in the future. Read below for an excerpt from Starless—featuring the favorite character I mentioned—followed by the giveaway form and rules! “What tales?” There was a dangerous edge to Brother Merik’s voice. “They say the warriors of Pahrkun are as fierce and deadly as the desert. Brother Yarit took a deep breath. “Watch.” Standing at the edge of the gravel patch, he flexed his knees deeply, centering his weight above his left leg. His right foot reached out slowly, little toe descending first, then the outer blade of his foot. The ball of his foot, then the sole and heel descended with a slow, rolling motion. There was not a single crunch as he shifted his weight from his left to his right leg, then repeated the motion on the other side. Again and again, until he’d crossed the entire distance without a sound. For the first time, I found myself truly wanting to learn what Brother Yarit could teach me. He was strange to me with his dishonorable ways and his coarse language—and I could not yet bring myself to forgive him for Brother Jawal’s death—but Brother Saan was right. There were things I could learn from him that I could not learn from anyone else. That night I fell aching onto the carpet in my chamber. It was verging into autumn and the day’s heat gave way to a chill. I pulled a thick wool blanket over my sore body and slept deep and hard. I dressed as swiftly as I could, donning a loose-fitting tunic that fell to my knees, wrapping my sash and my heshkrat around it and thrusting my dagger into the sash. In the Fortress of the Winds, we were shielded from the worst of the sun’s rays, but it would be different in the open desert. I wound a long scarf around my head and neck, securing it with Brother Yarit’s—curse him!—garrote, and laced my feet into tough camel-hide sandals. Throwing on my plain white woolen robe, I blew out the lamp and hobbled through the fortress in near darkness, making my way outside and down the long carved stone stairways to the horse canyon, where a cluster of men with torches was gathered. The horse canyon was long and narrow. Scrub grass and gorse grew there, and there was a brackish watering hole; enough to sustain the few hardy mounts—anywhere from four to six—that the brotherhood kept on hand for errands. There was a wooden gate across its opening and it had been left ajar, but it seemed the remaining horses had better sense than to flee into the open desert. Two of them were saddled and waiting. Brother Tekel, who tended them, stood at their heads. Brother Saan returned his salute with both hands. “Ride with my blessing.” We set out at a slow, steady trot. I had ridden out from the fortress before, but never farther than a hunting excursion and never at this hour. Everything looked strange and unfamiliar in the bloody light of the Dark Moon. I gazed at the sky overhead, trying to imagine it filled with a thousand upon a thousand sparkling lights, and could not. The air was still, not a hint of breeze, and the sound of the horses’ hooves on the arid, stony ground seemed unnaturally loud to me. Then again, perhaps yesterday’s lesson with Brother Yarit had made me particularly sensitive to the sound. I couldn’t believe he’d fled. It felt like a betrayal, especially after I’d worked so hard yesterday. I watered the horses, their sweat-dampened hides steaming in the dawn air, while Brother Merik scoured the area for signs of Brother Yarit’s passage. In the desert we say Make haste slowly. Brother Merik and I resumed our ride at a brisk walking pace as the sun cleared the mountains and began to climb overhead, dispelling the night’s chill. Heat began to mount. I shrugged out of my woolen robe, lashing it to the packs behind me. I was at once exhilarated and scared. It was one thing to catch a glimpse of one of the Sacred Twins in the distance from the safety of the fortress; it was quite another to face the prospect of encountering one or both in the open desert. Pahrkun and Anamuht guarded the realm to which they were bound, but that didn’t mean it was safe to be in their presence, no more than it was safe to encounter lightning or a sandstorm or any great force of nature. Courtesy of Tor Books, I have a hardcover copy of Starless to give away, plus a swag bag featuring a Starless quote postcard, hawk feather, #FearlessWomen sticker, #FearlessWomen pen, and star confetti! Giveaway Rules: To be entered in the giveaway, fill out the form below OR send an email to kristen AT fantasybookcafe DOT com with the subject “Starless Giveaway.” One entry per person and a winner will be randomly selected. Only those with a mailing address in the US or Canada are eligible to win this giveaway. The giveaway will be open until the end of the day on Wednesday, June 20. The winner has 24 hours to respond once contacted via email, and if I don’t hear from them by then a new winner will be chosen (who will also have 24 hours to respond until someone gets back to me with a place to send the book).